Did you know, serotonin helps the body regulate anxiety, happiness and mood? By eating well and feeding the healthy bacteria in your gut, the body's ability to generate serotonin is significantly increased, helping you feel more relaxed, happy, and confident. I recently took an introductory course on the importance of our digestive system and self care, and it's re-inspired me to have a greater curiosity in the kitchen with plants. The course was given by Alex Laird, one of the Founding Directors of 'Living Medicine', a charity that aims to reskill us all in using food and herbs for our everyday healthcare, sharing knowledge across cultures. The course was held at Chelsea Physic Garden - a hidden green oasis - located in South Kensington and home to a unique living collection of around 5,000 different edible, useful, medicinal and historical plants. They host a range of events throughout the year, and the next 'Living Medicine' course is on 15th October discussing 'Sleep, Anxiety & Fatigue'. The digestive system is now seen as fundamental to our overall health in most traditional medicine systems. Digestion has a strong influence on our nervous, hormonal and immune systems. The role of foods is now increasingly recognised in conditions not previously associated with diet: auto-immune disorders like rheumatoid arthritis or multiple sclerosis; mood and behaviour problems such as autism, ADHD and depression; degenerative disorders such as Alzheimers's and arthritis; allergic conditions including asthma and eczema. Inflammation underlies these and most chronic disease like obesity, heart disease and cancer. We can modify these destructive inflammatory responses by the kinds of food we eat and how we eat them. Common problems like heartburn, indigestion and constipation can be managed with understanding how to use foods, herbs and spices in self care. There are obviously other factors that affect our digestive health, such as our stress load: sleep, diet, alcohol, smoking, weight, liver function, circulation, mood, exercise, chemicals, food quality etc, but you can begin to support your digestive health by understanding the basic digestive functions and being mindful of your body. 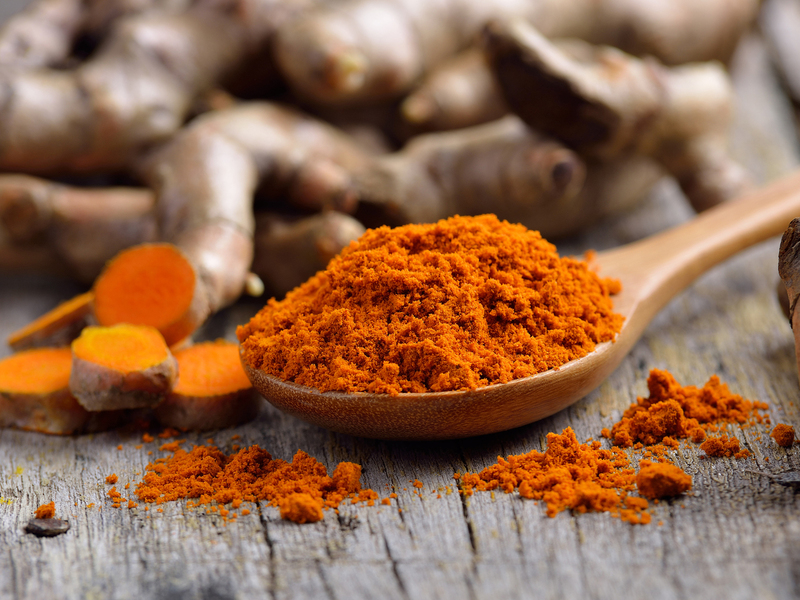 Turmeric is the root stalk of a tropical plant that's part of the ginger family. It dramatically Increases the antioxidant capacity of the body. The main points I took from the course were the importance of eating as much variety as possible - this sounds obvious but after seeing a small selection of herbs and spices in Chelsea Physic Garden, I was reminded of the vast natural variety - and also that the 'medicine' in plants is often found in the skin, plith and seeds. Medical Herbalist, Alex, encouraged us to enjoy all the different parts of a plant and experiment more in the kitchen; whether that's by adding the stalks as well as leaves of fresh herbs to a salad, trying the inside plith of a banana skin or when cooking with garlic or onions keeping the skin on to enjoy the benefits of the pigment leaking into the stew. Ginger is warming and calming to the digestion, anti-nausea and anti-microbial to many common stomach bugs. Warms cold hands and feet. Carminative (relieves bloating), liver support, anti-microbial, powerful anti-inflammatory. Carminative (relieves bloating), stimulating to the liver. Improves appetite, increases milk production and eases colic. Expels upper respiratory catarrh. An eyewash for conjunctivitis. Has a balancing oestrogenic action. Supreme herb for the digestive system, eases stomach cramps and nausea, helps expel gas from the bowel and prevent fermentation in the stomach. Warming stimulant to appetite and circulation. Antiviral, antibacterial and anti fungal. Helps reduce blood sugar and ulcer causing Helicobacter pylori. Anti-microbial, probiotic due to its inulin and other compounds, supports cardio-vascular health. Onion, shallot, leek etc belong to same Allium genus family and have similar actions. Stimulation carminative that helps to clear your liver and head. Refreshing as well as antispasmodic, cooling and anti-microbial. Useful in coughs and colds, supports liver function and helps stop itching when used topically. Calming and a sedative, useful to promote restful sleep, dispel colic and cramping pain. Key ingredient in gripe water. Warming and settling to the gut. The eugenol content promotes digestive enzymes, is analgesic and antiseptic. Most beneficial when drank as a tea after a meal. Now back at Potage HQ in Battersea, we are constantly striving to work on our menu offering and improve things, and I have come back totally inspired and overflowing with ideas to incorporate into our current and new menu items. We want to ensure we are doing our part in feeding the happy bacteria in your gut, in turn making you feel less anxious, sleep better, and keep you in a better mood.